With the introduction of Apple’s new MacBook Pro models, the company also has quietly increased the price of the 12-inch MacBook by $100 in Canada. Earlier this spring, the 12-inch MacBook retailed for $1549 CAD, but as of today it’s $1649 CAD for the entry Intel Core m3 configuration; the Intel Core m5 configuration also jumped $100 to $1999 CAD. 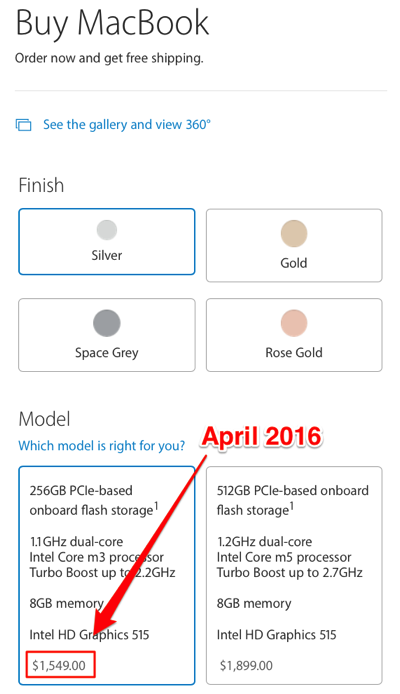 The price increase is for the exact same specs—no hardware refresh was included with the price hike. The previous April 2016 prices were based on the exchange rate of one U.S. dollar worth $1.19 CAD, while the updated price is based on a rate of $1.27 CAD, as the Loonie continues to weaken. Currently, one U.S. dollar is worth about $1.34 CAD, so Canadians are still ‘ahead’ here? Back in April, Apple refreshed the 12-inch MacBook with new Intel processors, better battery life and a Rose Gold colour option.